Maui has a lot of farmers markets – in the morning, or through the afternoon, at which point, pickings get slim. So if you’re not an early riser, too bad for you. But now, Maui has a night time farmers market. Hurray! The Upcountry Market in Pukalani, although many would say it’s in Kula, since it’s on the edge of both places, is getting evening hours. 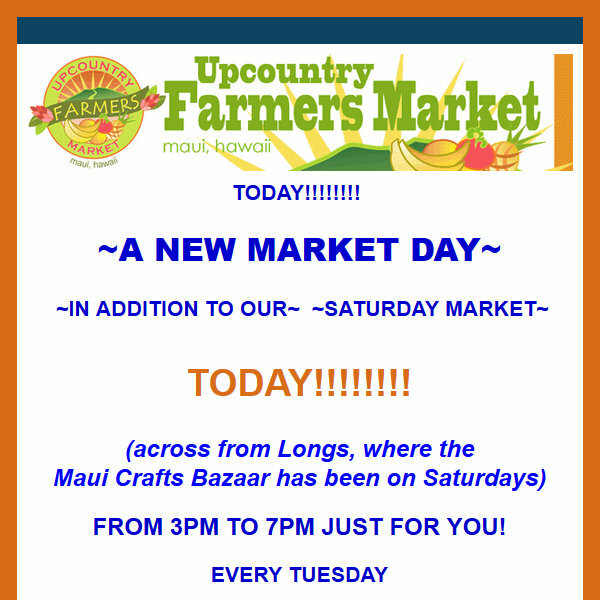 Tuesday evening Farmers Market on Maui, 3 pm to 7 pm. Tuesdays 3 pm to 7 pm – in the area across Longs Drugs or Longs Pharmacy, there will be farm stands with fresh, locally grown produce. Some of it is organic and some is conventionally grown, but the produce is usually labeled, and you can always ask. So get your green fix. More info in the email from Haiku Helen. Another tip: there’s a store, which is very much like a farmers market called Rowena’s Produce in Kahului. It’s open Monday through Saturday from 7 or 8 am to 6 pm. I’ve even gotten there after 6 pm and they’ve still been open. It’s like a farmers market but in a store. Prices are reasonable. Rowena used to have a booth at one of farmers market on Puunene Road, but last year, moved her produce business to a store. The advantage is that she has refrigeration. If you can’t make it to other farmers markets, her produce is very similar and has a good selection, and is usually local. Just like other farmers markets, the selection varies from week to week, and she can be sold out of certain fruits or vegetables, or not have any due to the weather. But, Rowena does not have organic produce, so if you shop in the evenings and need to buy organic, the Tuesday Upcountry Market is your best bet.